ojas.gujarat.gov.in GIDC Recruitment 2016 Apply Online. Gujarat Industrial Development Corporation (GIDC) Recruitment for Various Posts 2016. Gujarat Industrial Development Corporation (GIDC) has recently released a recruitment notification to fill 187 various posts. 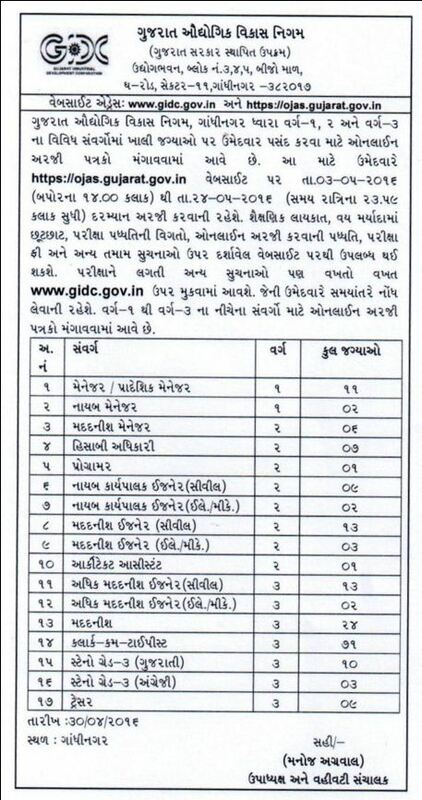 Interested eligible candidates who are looking jobs in Gujarat can apply in prescribed format before last date. Other details like age limit, educational qualification, selection process, application fee, pay scale and how to apply are given below. Educational Qualification: Please Read Official Notification for Full Details. How to Apply: Eligible candidates may Apply Online ojas.gujarat.gov.in GIDC Recruitment 2016 through official site of ojas before las date.